Ugly People Beautiful Hearts is a poetry book with over 70 poems that explores loneliness, quiet sadness, bursts of happiness, and contentment over the fact that everything you have, will eventually go okay. But that’s sort of beautiful in its own right. It has verses moving between the feelings of loving someone, feeling loss, trusting the night sky, losing your light, resolving that hurt is beautiful, and finding compassion in a stranger’s smile. Poetry is not for everyone, and I get that. Some people think it’s too sappy or overdramatic, while others can’t see the point in reading short pieces of writing without there being an entire story behind it. There are countless reasons to prefer not to read poetry, and I respect those opinions. However, if you are one of those people I urge you to give this poetry collection at least a try. Who knows- you may be surprised by what you find! When I received an email about possibly reviewing this book I was instantly intrigued. I love poetry, but I haven’t read much of it apart from what I’ve read in English class. The description of this little collection made it sound like these poems would strike a chord with my emotions, and I was not disappointed. “The stars, like the hollow eyes of a god forgotten, marry the sadness of the exhausted hour and inspire a little chaos, a little gentleness, to those below. Can’t you just see those stars shining in the sky? Can’t you just feel that unsettling mix of emotions whirling inside you? It’s the emphasis of these little details of everyday life that make this poetry collection so resonating. I believe there’s something in them that we can all connect to, despite the fact that the poems were clearly very personal to the author. Although the poems were all linked simply by the nature of their theme (love, emotions, etc.) it would have been nice if they told a story or chronologically created a spectrum of emotions. Maybe it’s simply because I don’t often read poetry collections and I’m not used to the way they read, but it seemed to me like these poems were in a random order at times. I think some more evident organization would have made reading all the way through this book more enjoyable. Overall, this poetry collection is absolutely beautifully written and well worth reading. I would have liked to see more of a connection between the poems, but that is a minor detail that should not deter you from picking this one up and giving it a go. 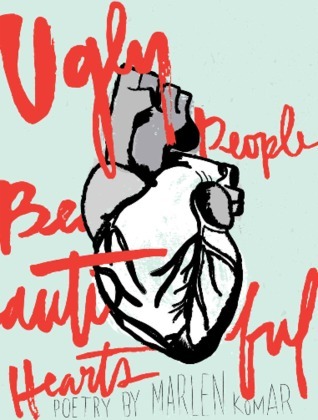 Ugly People Beautiful Hearts focuses on fundamental human emotions that we all experience at some point in our lives, making it a raw, meaningful, and memorable read. Please keep in mind that this rating is for poetry collections and would be different for a novel. The way I rate books is that for me, poetry often does not compare to the enjoyment I get from reading full novels. Would I recommend it to a friend? : Yes, especially to someone who has just been through a break-up or emotional point in their life. I think it could be really therapeutic to see some of those feelings reflected in these poems. A big thanks for poet Marlen Komar for contacting me and providing me with an opportunity to read and review this book! Do you often read poetry? Are there any poets or collections you would recommend? Let me know in the comments section below! Next > May Favorites: Age of Ultron, Brandon Flowers, and More! That poem is excerpt is WOW. I love poetry and am constantly scouring for different styles so I might check this one out in the future!